AN-OEO-2S optical repeat/amplification device，applied in optical repeat prolongation and OEO amplification for transmission equipments. So far the transmission distance of optical access equipments on LAN and access layer is generally short, single mode equipments can hardly go beyond 100km, multimode equipments go even shorter distance, no more than 5km normally. A low access optical power，configure output optical power at will access rate can be from 0—2.5G up to 2.5Gb/s. Single fiber &dual fiber mode is optional. Maximum transmission distance of data signal is around 120 km. 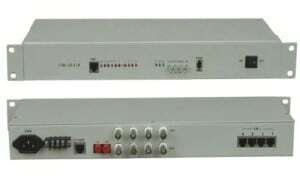 Optical ports of the equipment are all LC / PC port, please use the corresponding fiber-optic connections. The definition of all the optical ports are left to send, that is, “T”. Please be careful with the optical power may be greater than-5dbm, escape the direct human eye contact, so as to avoid harm.”R” shows receive which indicates the transmission from the external light source or wire jumper to the devices. Please note that receiving SFP optical power should be less than-3dbm, such as beyond the scope of optical attenuator, connect the equipment to meet the range, in order to avoid equipment damage. AN-OEO-2S optical repeat/amplification device，applied in optical repeat prolongation and OEO amplification for transmission equipments. So far the transmission distance of optical access equipments on LAN and access layer is generally short, single mode equipments can hardly go beyond 100km, multimode equipments go even shorter distance, no more than 5km normally. The equipment is requested to solve the solution for fiber optic transmission distance exceed of the equipment transmitting range ability . It can replace expensive optical power amplifier used on network. The increase of transmission distance can be fulfilled through mode of relay. The network can be deployed and business can be open rapidly and conveniently through the equipment. It is equipped with low cost, low power dissipation and small volume. It is the low cost and high performance transmission solution.